As the quote says "A dream doesn't become reality through magic; it takes sweat, determination and hard work". Through 10 years of consistent hard work and tiresome efforts, we have yielded fruit of pride and world-wide recognition in NEBOSH IGC results. We are extremely happy and delighted to announce that one of our students from Kochi branch Mr. Sooraj Orpheus Jacob stood first over the globe in the prestigious NEBOSOH IGC examination for the year 2017-18. To our surprise, he scored an astonishing 246 out of 300 marks in the IGC examination. This impressive performance gained us tremendous appreciation, respect and reputation from world's leading professional health and safety bodies and fellow competitors. At this moment, we would like to specially thank our trainers who as role models have broaden students' horizons beyond standard classroom lessons with their innovative teaching style and deeper insights into the subject. Without their invaluable guidance, inspirations, and suggestions, this achievement would not have been possible. We at NIST eternally are grateful to them for their unflinching insistence and support. Moreover, we have great pleasure in acknowledging our gratitude to all our staff at Kochi training center for assisting students in a most friendly manner. It would be inappropriate if we failed to mention the dedication and hard work of Mr. Sooraj Orpheus Jacob. During the intensive 10-days of training program, he actively engaged in learning activities and without any hesitation he interacted with our trainers to clarify doubts. He focused on training sessions without any deviation and took all our challenging assessments and mock exams seriously. Moreover, he systematically planned his schedule and worked hard towards his mission of becoming a competent safety professional. To honor his outstanding achievement, NEBOSH sent a personalized invitation to Mr. Sooraj Orpheus Jacob to attend Graduation Ceremony in the month of June at Warwick University (London), where he was awarded with a framed certificate and medallion by higher officials of NEBOSH. Being a safety pioneer for more than a decade, our institute honored this moment by offering 100% sponsorship to Mr. Sooraj Orpheus Jacob for attending the Graduation Ceremony. Hi Sooraj! How do you feel after getting such a prestigious award? 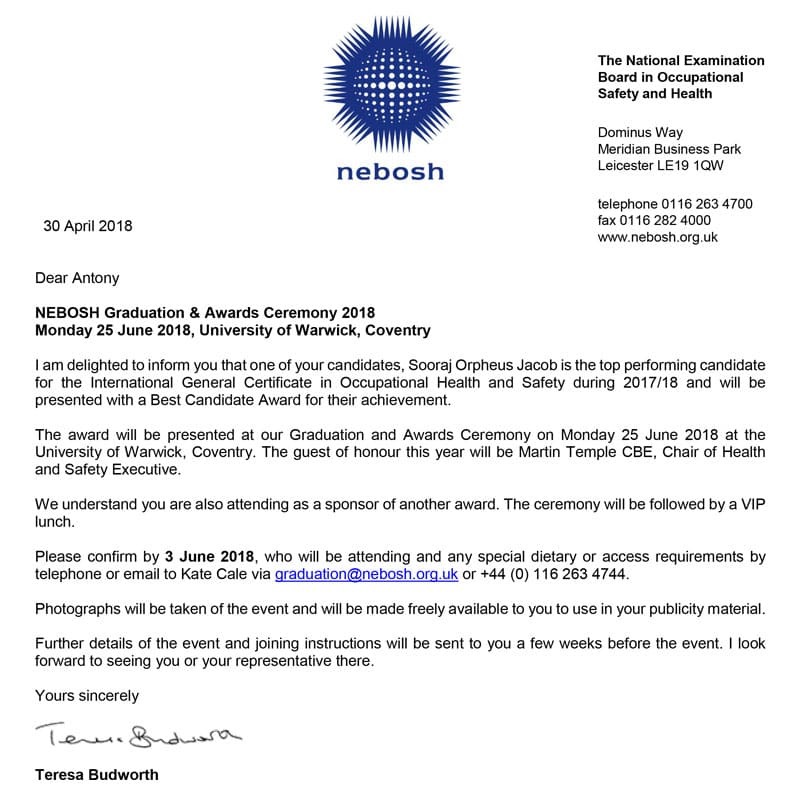 It was a surprise indeed to see the email from Nebosh mentioning the achievement of highest marks. I feel glad, grateful and honoured. How did you choose NIST? Even though I have been working in the role of a safety officer in the shipping Industry, I thought perhaps it is a good idea to take a certification so that I could bridge my skills to shore based industries too. So I googled and came across NIST and Jane's explanation about Nebosh and its courses convinced me to enroll at NIST. How did you embrace this success? I believe that the success does not end in a certificate. The real success would be when I get to implement the knowledge and since my area of interest is in training and coaching, I am still looking forward for an opportunity to embrace it fully. What were your challenges in learning IGC? The fact that the written exam is intensive theory which demands a lot of time and strategy. Any Success Mantra for achieving the highest global rank? Prepare and study in advance to avoid last minute exam pressure. What are some tips and advices to your followers? Classroom session is only for guidance. For exam purposes, it is better to study on your own and before the class starts. Feel free to contact me if you need any assistance. How the scope of Safety Industry will be in the future? I see an increasing awareness over the years, especially in developing countries like in India. I hope every industry and individual gives more priority to safety and environment. Most importantly, human psychology has to be considered carefully while implementing Regulations, rather than just enforcing rules. We thank Mr. Sooraj Orpheus Jacob for his time to share his invaluable thoughts during this time and wish him all the best as our alumni. We at NIST constantly strive to deliver better results in all our safety training programs. On behalf of NIST, we would like to sponsor more number of such candidates in the near future. Finally, we salute Mr. Sooraj Orpheus Jacob for taking us forward and making us proud in the global arena of health and safety.